Today, dental patients with missing teeth are fortunate to have a tooth replacement choice that is far better than both traditional dentures and dental bridges. Implant-retained or implant-stabilized dentures both provide numerous advantages over conventional dentures. What Are The Differences Between Fixed and Removable? Fixed implant dentures in San Diego require more implants than the removable type. They can restore 100% chewing function. 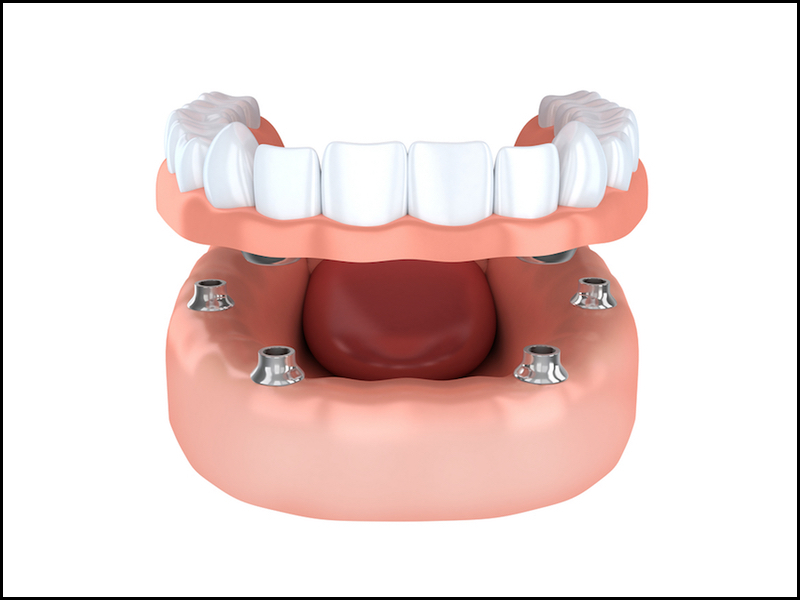 Removable implant dentures in San Diego, sometimes called snap-in, may require just 4 implants to stabilize the upper arch and just 2 for the lower denture. Removable implant-stabilized dentures can restore up to 90% of chewing ability. Call 619-295-4545 to schedule an implant denture consultation with Dr. Ortega. Factors such as bone condition, cost, convenience, diet, and sleep conditions will influence the recommendation. Implant dentures in San Diego require a sufficient amount of healthy bone structure for placement. The condition of your jaw bone affects whether or not it can support implants and where the posts can be inserted. Fixed implant dentures cost more but some individuals believe the benefits outweigh the extra expense. Fixed implant-stabilized dentures don’t have to be removed for cleaning. Patients who have found it inconvenient to clean traditional dentures would face the same issue with removable implant-retained dentures. Fixed dentures are stronger than removable dentures. Patients who choose foods that are harder to chew should consider this. People with TMJ or sleep apnea may find it harder to manage these conditions if they have to remove their dentures at night. For an implant denture consultation, call us at 619-295-4545.